Originally from WELLINGTON, recently relocated to Tauranga. Curtain maker of 30 years +, specialist in making of curtains and Roman Blinds. I will make to measure on your supplied fabric, you arrange the fabric to be sent to my workroom and I will make and deliver freight free to you. If you need help with measuring contact me and I will advise how to measure. Contact me for a custom quote today. ** To all my WELLINGTON CUSTOMERS I am still available for your work, please get in contact with me, upon completion of your curtains/blinds I will courier freight free back to you. Thank you for your excellent service, the drapes turned out perfectly and with the pattern matching they are very professional. We are thrilled with the look created. I'ved just added another superbly made set of roman blinds, and a pipe-edged, cane chair fitted-base cushion to the mix of furnishings in my home that have been made by Lesley. My friends tell me that my place looks like it has been fitted out by an interior designer... Loving everything you've made. Thanks so much Lesley. I've now had several sets of curtains, roman blinds (both cord and mechanism pull) made by Lesley and cannot recommend her highly enough. She's a friendly person to deal with and totally knows her stuff. Her attention to sewing detail is phenomenal and everything she has made for me has been a perfect fit. Superb trader - highly recommended. 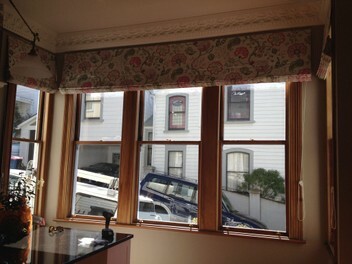 Lesley did an amazing job making our roman blinds! Thank you Lesley, Roman blind looks awesome. Quality workmanship and well priced. Lesley offers a fantastic service and high quality blinds. I had 6 blinds made of various sizes and both outside and inside fitting and they are all superbly finished and look great. I had a hiccup with measurements and Lesley was brilliant in helping to resolve this. Her focus on customer service is fantastic. I will be back for more blinds and a squab in the near future. Amazing service! - great blinds and very helpful, would recommend to all! Fantastic service and quality, gave great advice on getting the right fabric. Very accomodating to my last minute changes. Have already recommended to friends. Thanks Lesley. Very happy with the two blinds we had Lesley make for us. The workmanship and attention to detail is excellent, and she did a lovely job with the pattern matching. Highly recommended! I would highly recommend Lesley to make your curtains - she has made curtains for 3 bedrooms in my home and each curtain made is of fantastic quality. I made the mistake in one instance of ordering the incorrect (insufficient) amount of fabric for one curtain. When the remaining material arrived she made the curtain to a high standard where it is impossible to tell where the joining seam is. A talented lady. Thank you Lesley. Very happy with the great service Lesley provided. She did an excellent job on cutting down a roman blind to fit a new window and has given it a new lease of life and saved us some money. Thanks Lesley! Lesley did an amazing job (even when I got some measurements wrong) and I would not hesitate to use her again in the future. Lesley made two roman blinds for me. She was friendly and helpful, and I'm so happy with the blinds - good quality at a very reasonable price. I have already recommended Lesley and The Sewing Room to friends. Lesley made a roman blind for us. Sewing and service was to an excellent standard. And the price - much more reasonable than the usual curtain places. Lesley also did a minor repair to another curtain on the spot. I would happily use her again. Thanks Lesley! Lesley did a wonderful job on cushions and squabs, can't wait to get some roman binds done. I'm a very happy customer most impressed by the high standard of workmanship and the fast turnaround. As a bloke I'm a simpleton in such matters but Lesley took the mystery right of things. Well worth the drive out. No hesitation in recommending to others!